Welcome to Leigh Community Art Group. We are a group of about 30 amateur artists who meet regularly to share art and experiences. We always offer a warm welcome to everyone regardless of ability. Beginners are offered all the help they may need should they ask for it. We meet on Monday evenings ,except Bank Holidays, at Leigh Sports Village, Leigh Harriers’ Lounge, (Adjacent to running track) between 6.30 p.m. and 8.30.p.m. Great news for art lovers! Leigh Community Art Group's Christmas & New Year exhibition has been extended until 4 March 2014. It is in the Visitors Centre at Rivington which is open Wednesday's, Saturdays and Sundays. So if you are getting out to stretch your legs after any Christmas and New Year Excess why not call in and have the chance to buy an original work of art for a present or treat for yourself. Meanwhile please note our club does not reopen at Leigh Sports Village until Monday 19 January at 18.30. As always new members very welcome.
" 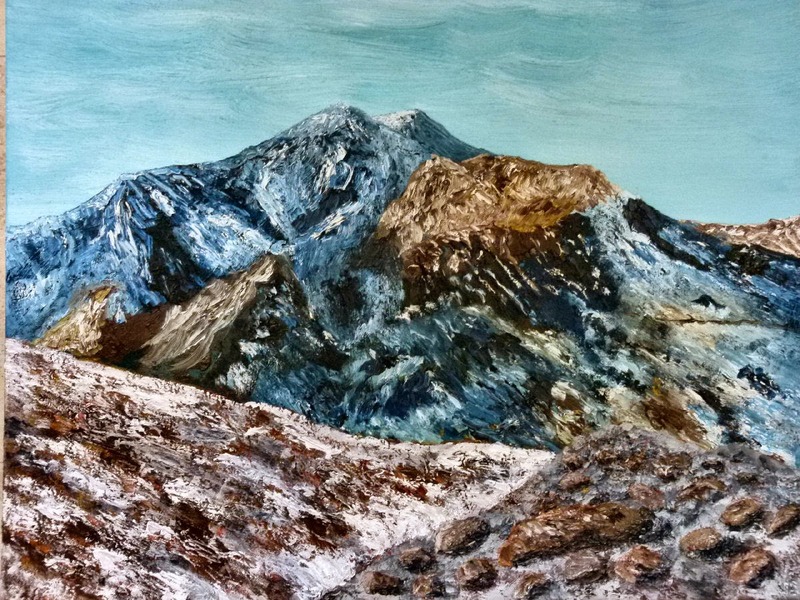 First Snow, Tryfan " by one of our artists. A member posts for the first time! Culcheth Show, Nov 9, 2013 - photos now available. Here is the latest work from Brian called "The Rockies", in acrylic. New Works on Our Website! A Trip To Paris For Free!